Restoration and Modification of a 19th Century Renaissance Revival Mantelpiece. Showing newly created section without finish. 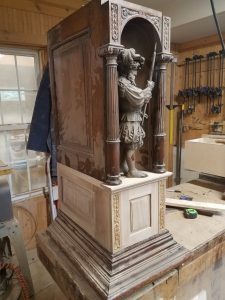 Clients recently purchased a magnificent example of Italian carving, a Nineteenth-Century Renaissance Revival mantlepiece, and hood, all in beautiful European Walnut. They wished to have this installed in their new Raleigh home but immediately ran into a seemingly impossible obstacle. The opening for the fireplace was to low to meet modern fire codes and for any modern fireplaces. Fortunately, the owners thought of extending the pilasters on either side of the fireplace by inserting a 10” high block of material, either of stone or wood. 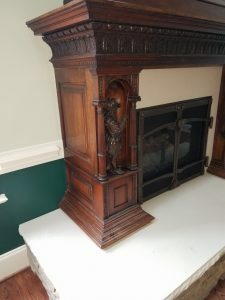 When I first looked at the mantlepiece, I knew that any modifications would have to blend perfectly with the original structure. The proportions, the decorative elements, the wood and finish all would have to be considered. I decided that the best place to insert the “risers” would be just beneath the two carved statues of soldiers which flank the hearth. Their greater elevation would make them more prominent and the vertical flow of decorative molding would continue down the front of the pilasters. Showing the newly created modification with finishing. I built two plywood boxes to support the weight of the mantle and provide structure for the addition. The tops of these were covered in solid European walnut with the same elaborate moldings used in similar horizontal pieces in the mantle. The front and sides of the risers were clad in raised panels and I also replicated the carving appearing above the soldiers’ heads. 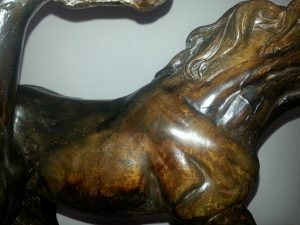 The original finish and wood have undergone subtle changes due to oxidation, light exposure, and atmospheric pollutants all producing a patina which it would be a crime to destroy through refinishing. 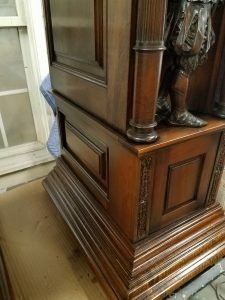 I cleaned the existing finish lightly with mineral spirits, leaving the accumulated grime in the cavities of the carving and the grooves in the molding. I then re-waxed the entire piece with beeswax and hand buffing. 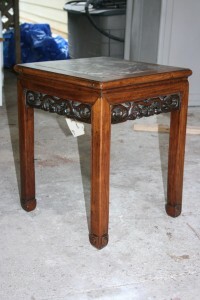 The result was to accentuate the carving and molding while enhancing the beauty of the old walnut. The final step was to take the raw wood of the new components and replicate a 150-year-old finish and generations of waxing and polishing. A coat of amber shellac sealed the wood and brought out the warmth of the walnut. A series of applications of different tints of aniline dye replicated the depth of the color of the old wood. Here is the restored & modified mantle installed in the clients home. Dark walnut die was brushed into the recesses of the moldings and carvings. A very light coat of tinted finish replicated the old original varnish which had darkened with age. Finally, several coats of clear varnish protected the wood and hand waxing created the same sheen as the old. With the skill and versatility of the Living Stone Building Company, the mantle was reassembled in the owners two-story living room, standing on their custom stone hearth. A modern, gas fireplace with cast iron doors complements the character of the mantle. Special provisions were made to protect the mantle from the heat of the fire. Although wood is the primary material encountered at Capital Restoration, our craftspeople are also skilled at the restoration of metal artifacts. A complex and challenging example is an Indo-Persian suit of armor, dating from about 1800. Consisiting of a helmet, arm guards, breast plate, back plate and a shield, it was largely intact including the cloth padding behind the plate armor and shield. Originally, the suit would have also have included an axe or mace (metal club). This armor is a show piece, intended for ceremonial use and is elaborately decorated with gold. It’s very small size indicates that it was made for the child of a high ranking individual. The armor is hammered out of steel sheets and heat treated to produce a dark blue/grey patina. The craftsmanship is of a very high order with beauiful symmetry. 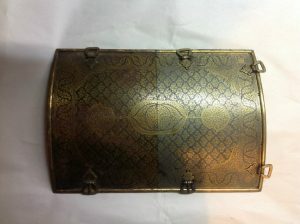 The gold decoration is very fine and detailed. Gold powder was mixed with mercury and brushed onto the steel which was then heated causing the mercury to flash off and amalgamating the gold to the steel. Unfortunately, the armor was stored in damp conditions for many years and the steel oxidized and much of the gold was covered over with rust. Shellac had also been brushed over the metal in an ill advised attempt to protect the metal. The shellac had oxidized and darkened. The first step in conserving this artifact was to carefully remove the cloth padding and place it in protective storage. Some modern wire which had held parts of the armor together was also removed. Rusted chain mail attached to the back of the helmet and the arm guards was treated with a solution of phoshoric acid and tannic acid powder diluted in ethanol and distilled water. The dirty, degraded shellac was removed from the steel plates with denatured alchol. The rust on the steel plates was treated a small section at a time by covering it with phosphoric and tannic acid and gently rubbing the rust with a miniature fiberglass brush. Great care was taken not to detatch the gold fire guilding which was found still largely intact, underneath the rust. The metal was rinsed with distilled water and thoroughly dried with a hair drier. The final step to treat the metal was to coat it with microcstalline wax and buff gently. The cloth linings were then stitched back onto the armor with cotton thread. The phosphoric acid forms a stable phosphate layer which resists further corrossion. The tannic acid replicates the dark heat patintion of the steel which provides a more uniform apperance between the areas of treated rust and the orignal patinated steel. Much of the gold decoration was still found to be inact undeath the iron oxide and could be preserved although a small amount of gold had no stable substrate to adhere to so could not be saved. Many years of handing and cleaning wore away much of a thin wash of gold from the edges of the shield and raised areas of the arm guards. Overall, the suit armor is remarkably intact and provides a beautiful example of the armorer’s and gilder’s art. The icon as it arrived at Capital Restoration showing the missing gesso and paint. In the Orthodox Christian Churches, icons are religious works of art which assist the worshiper to focus their attention during prayer. Traditionally painted on wooden boards, they are vulnerable to changes in relative humidity which causes the wood support to expand and contact fracturing the paint layer and causing it to lift. Such was the case with an icon brought to Capital Restoration last year. 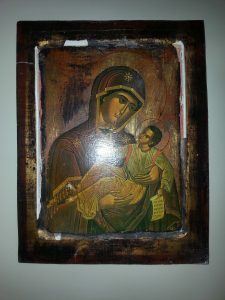 Although it is a recent reproduction, it utilized a solid wood board and the change in environment from Greece to the eastern seaboard of America had already caused damage to the paint and to the gesso (traditionally made from rabbit skin glue and gypsum) border which frames the painting. During the restoration, the missing gesso was built up with fresh gesso and painted with gouache paint (a water based paint which is more pigmented and opaque than water colors). Then the missing paint from the fringe of the Madonna's robe and the feet of the Christ Child was carefully in-painted with gouache paints. The new paint was then sealed with a coat of varnish over top of the existing varnish. The icon after restoration with the gesso replaced and the lifting paint in-painted with gouache. 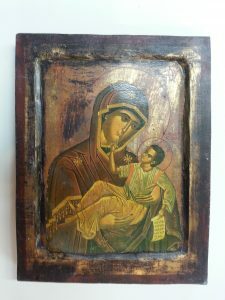 This icon is an excellent example of where the advice offered by the restorer is vitally important for the ongoing conservation of the piece. A stable environment is critical for it's future longevity. Avoiding extreme, unheated environments like attics and basements can help. Keeping pieces away from heating ducts and direct sunlight will help them from becoming as dry. Ideally, a whole house humidifier will keep the relative humidity within limits suitable for furniture and artwork. John Allen of Capital Restoration provides such advice in his detailed treatment reports which accompany each restoration. The chair broken into pieces. Note the snapped mortise and tenon joint. During a recent move, one of the movers tripped and fell. Fortunately, he was uninjured but the antique chair he was carrying did not fare so well. 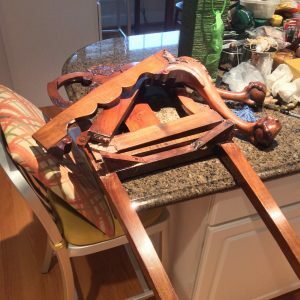 It was shattered into many pieces and the mortise and tenon joints between the legs and seat were broken. There were also numerous scratches and abrasions to the wood and finish. The chair was made during the reign of George II of Great Britain (1727-1760) from the newly fashionable wood of the Cuban Mahogany tree. This refined and beautiful piece featured delicately carved ball and claw feet and carved foliage on the knees of the front legs and on the crest rail of the chair back. Although the chair has been refinished (probably many times) the wood has had time to develop the lovely light golden brown patina of aged mahogany. This patina only extends to a depth of a few wood cells. If these are sanded through during refinishing, the original intense red of the mahogany is revealed. Over many years of light exposure this red will again fade to a lighter, golden hue. Fortunately, this chair has never been subjected to heavy sanding and the original crispness of the carving is still intact. The most serious challenge in the restoration of this chair was to re-build the broken mortise and tenon joints in such a way to remove a minimum of the original wood while producing a strong joint. 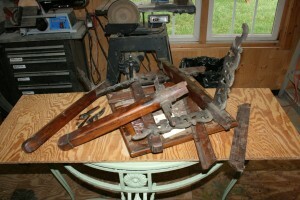 First, the broken wood was chiseled from the mortises or slots in the chair's legs. The chair rebuilt, French polished and ready for use. Next, a slot was chiseled into the underside of the seat's rails and a thin slab of mahogany, the tenon, was glued in place with hide glue. This tenon projects beyond the ends of the chair rails and glues into the mortises of the chair legs. Once the chair had been re-assembled, several small areas of missing carving were filled with mahogany infills and carved to match. These fills and the scratches and abrasions were carefully matched to the surround mahogany with artist colors. The repairs were then sealed with clear lacquer. 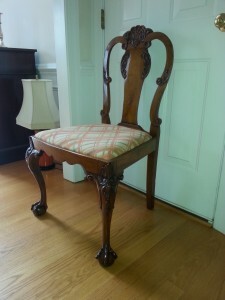 Finally, the finish received a coat of French polish to provide an even sheen over the entire chair. The chair is now none the worse for it's experience and ready for another 250 years of enjoyment! One summer afternoon, a client brought a box into Capital Restoration containing the fragments of a table and asked if it could possibly be repaired. Upon examination, it was determined that the table was Chinese and made in the nineteenth century from East Indian Rosewood. It had the traditional miter joint leg corners, favored by the Chinese craftsmen as the most aesthetically pleasing way to join wood at right angles. Below the table top ran a pieced and carved apron and the top was an inset slab of polished marble. All of the component pieces were present except some fragments of the carved aprons. The table in pieces with broken carved aprons. The first task was to repair the aprons and the broken pieces were glued together with cyanoacrylate adhesive. This was chosen because of it strength and ability to adhere to oily woods such as rosewood. The missing fragments of carving were filled in with slivers of rosewood and carved to shape. Next, all of the old glue was carefully scraped out of the joints. The glue of choice for traditional Chinese woodworkers was fish glue and this was used to re-glue all of the joints. This ancient glue is extremely versatile and strong and in many ways superior to modern adhesives although it is not as convenient to use. The rosewood had been hand scraped to a very smooth texture and had a simple oil finish. Before the advent of sandpaper, wood was smoothed with steel scrapers which actually cut the wood cells producing a more radiant figure from the reflected light. Wishing to maintain the original appearance and patina of the wood and finish, a minimal approach was used for its restoration. The finish was cleaned with mineral spirits and several fresh coats of walnut oil finish were applied with a cloth resulting in a matte sheen. The table after reassembly, cleaning and polishing. 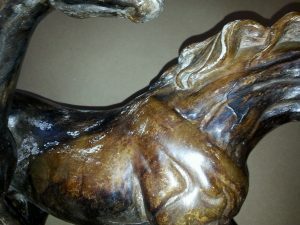 A colored paste wax was applied and the finished buffed to a soft luster. The final step in the restoration of this beautiful table was to clean the marble top with and polish it with microcrystalline wax which provides both protection and shine. When restoring antique furniture and decorative arts, it is important that the restorer have a thorough understanding of the materials and methods of the original craftsman. The use of the incorrect materials or methods can lead to a failure in repairs, unanticipated deterioration of the object and adverse effects on its appearance. 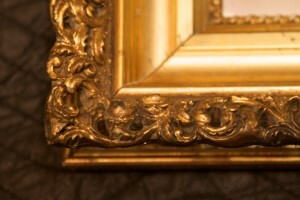 At Capital Restoration, all pieces which come to our studio receive a careful evaluation and a treatment proposal outlining the restoration process to be followed.